The Combo Hosted Karaoke Hire Package Host who also acts as an event style DJ while also facilitating the Karaoke. It is designed for functions segmented into various stages. Events that follow a pre-decided schedule or Run Sheet. Where there may be team karaoke performances at one stage of the evening and a dancing during another. 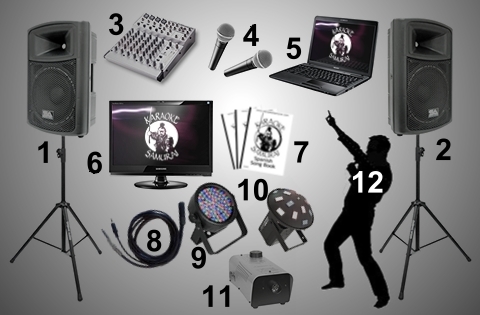 It is the Karaoke Hire Package popular for Wedding Receptions. Your Host can also act as the MC. As with all our packages The Combo Hosted Karaoke Hire Package includes a massive karaoke track list and DJ song list. The Karaoke component has the most up to date music and latest hits at their fingertips. You can choose the songs, genre and style of music that will be played at each stage of the event. When it's time for karaoke your guests will be amazed by our song list. A list that grows by dozens of songs every week. $750 inc GST. for 4 hours. When you hire the Combo package the Karaoke Host not only manages the karaoke and acts as the MC for the event they also act as DJ. The music at each stage of the event is managed. You can customise proceedings to suit the occasion. Video karaoke performances with CD quality sound. Add $120 inc GST.